Surgery clinics are run by appointment only. Our Practice policy is to see patients within a timely fashion of request, and we will make a determined effort to uphold this policy whenever possible. Our receptionists will ask the approximate reason for your appointment. This is to help ensure you see the right person in the right kind of appointment. The information you provide can be accessed by the relevant doctor which helps them plan your care. It remains confidential and we fully understand and respect that there may be times when you do not wish to comment - just let the receptionist know this. 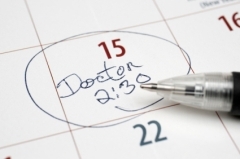 The appointments are 10 minutes long and usually a maximum of 2 areas can be covered. If you have a long list please either book a double appointment or be prepared to come back for areas not covered during the 10 minute appointment. Regardless of any ailment, patients, not seen within the last three years, may ask for a consultation with a GP; and patients aged 75 and over, who have not been seen by a GP within the last twelve months, may ask for a consultation. We make special arrangements to ensure that all those who are unwell or need to be seen urgently can be seen on the day. Please tell us as early as possible if you feel you have a condition that needs seen on the day. A doctor may speak to you by phone to help clarify the problem. It is Practice policy to offer a chaperone for intimate examinations. If you anticipate you may require one then please let the receptionist know so that this can be arranged for you. Please ensure you give us your consent if you wish us to leave a message for you to contact the surgery. Also you must update us of any change in phone numbers – especially mobiles.